Everything you need to know about visiting the Chicago Theatre (175 N State St, Chicago, IL 60601). The Chicago Theatre is best known for its iconic marquee, a remnant of its past as an opulent French baroque-style movie palace. When it opened 1921, the 3,600-seat theater screened films and hosted live jazz performances, dubbed by its owners the “Wonder Theatre of the World.” The theater (which has been renovated several times over) is equally magnificent today, hosting performances by bands like the Avett Brothers and Sigur Rós as well as comedians such as Chris Rock and John Mulaney. in one of the most ornate venues in the city. 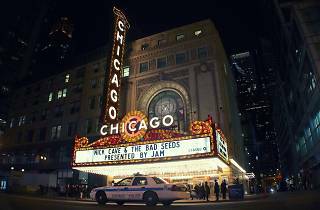 Even if you’ve seen a few concerts at the Chicago Theatre, you haven’t experienced everything the historic facility has to offer. Daily Marquee Tours allow visitors to stand on the venue’s stage and take a peek at the autographed walls in the backstage dressing rooms (see if you can spot signatures left by Frank Sinatra and Dolly Parton). 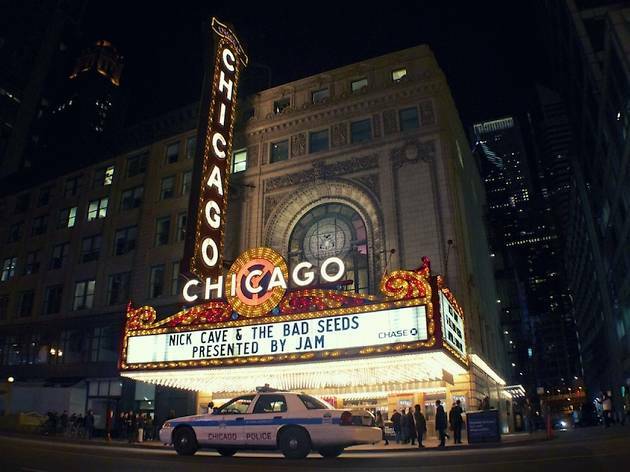 Some of the biggest names in music, comedy and entertainment stop by the Chicago Theatre, but you’ll need to keep your eyes peeled if you want to score tickets. Surprise sets from Louis C.K. and performances by contemporary acts like Harry Styles and Father John Misty tend to sell out quickly. You’ll need to pay close attention to the Chicago Theatre concert calendar if you want to catch your favorite acts in one of the city’s most beautiful venues. Our Chicago editorial team is constantly updating and reviewing the best attractions, activities and venues across the city, so that you're always in the know, with the best of Chicago at your fingertips. Chicago Theatre was most recently updated with new tips on June 30, 2017. El stop: Brown, Green, Orange, Pink, Purple (rush hrs) to State/Lake; Red to Lake.